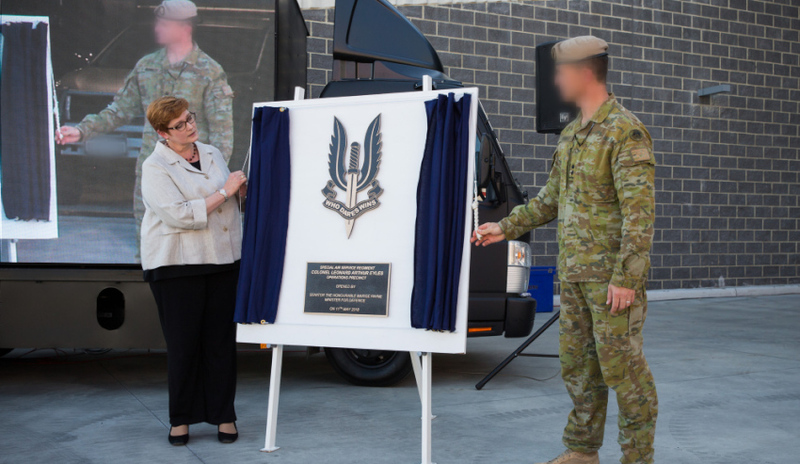 Minister for Defence, Senator the Honourable Marise Payne and Lieutenant Colonel ‘B’, Commanding Officer of Special Air Service Regiment unveil the plaque marking the official opening of the new facilities at Campbell Barracks, Swanbourne, Perth. Image via Commonwealth of Australia, Department of Defence. The Australian Army’s Special Air Service Regiment (SASR) has received a major infrastructure investment with the opening of their new headquarters and operations centre at Campbell Barracks in Perth. Minister for Defence Marise Payne said the new facilities marked the completion of the first phase of a $223.5 million four-year upgrade to the SASR’s home base at Swanbourne. Minister Payne joined SASR personnel past and present at the new facilities, which includes the new Colonel Leonard Arthur Eyles Operations Precinct, Pilgrims Mess all-ranks dining facility and upgrades to the Trooper Jonathan Church Gymnasium. "The Campbell Barracks redevelopment is essential to ensuring Australia’s special operations forces are ready to respond to support Australia’s national interests," Minister Payne said. "The Special Air Service Regiment has a long and distinguished history and the redevelopment currently underway is essential to ensuring the Regiment can continue to meet its vital security mission in the national interest. "Australia is facing an increasingly challenging international security environment and the Special Air Service Regiment is an important part of our response to any terrorist or security incident." All works to the infrastructure are due for completion in 2019. Campbell Barracks has been the home of the Army’s Special Air Service since its inception in 1957, and the upgrades are the first major redevelopment of the base since it opened six decades ago. Phase two of the redevelopment is underway and includes new and refurbished facilities for Operational Support Squadron, 152 Signal Squadron, the quartermaster store, and a new security entry point for the base. These works involve more than 530 tradespeople, 90 per cent of whom are drawn from the local WA community.